Welcome to CQUniMobile – CQUniversity services in the palm of your hand. 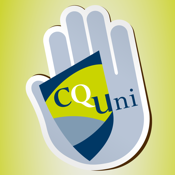 This app is an on-the-go tool for current students of CQUniversity Australia. - My Courses – provides a personalised view of your course enrolments, your course grades and assessment items with links into your Moodle course sites. - My Moodle – quick access to the Moodle mobile website. - My Mail – quick access to your CQUni e-mail account. - My Exam Timetable – provides a personalised view of your exam timetable. - Pocket Guide – includes student quick guides, campus maps, IT service information, and links to CQUni websites. - Staff Directory – search for CQUni staff and add contacts to your device’s contacts list. - News – provides easy access to subscribe to CQUni news feeds on your mobile device. - Feedback – let us know your ideas and suggestions for new features and improvements. New features are being planned and developed for future releases.